The Quad Mod gives you the traditional three-position tonal performance, while adding a valuable 4th pickup setting. This added tonal option turns on both neck and bridge pickups in series which is a thick and punchy tone much like a humbucker. However considering the two coils are located in completely different locations on the guitar the tone is as unique as it is useful and a welcome addition to the standard two single coil pickup configuration. Every little detail of the Custom Collection 50 Burl Burst was considered. A blend of elegance and power. We started with the highly figured burl maple top and then designed around it. The burst was designed specifically for this color with the gold set in to accent it. The pickups are hand selected to deliver a traditional tone. Grab your Burl Burst edition before they're all gone. Specs: Top: Burl Maple, Body: Korina, Construction: Bolt-on, Neck: Maple, Fretboard: Bird's Eye Maple, Fretboard Radius: Compound 10.5" to 16", Number of Frets: 22 Medium Jumbo, Inlays: Dots, Headstock: 1950, Scale Length 25.5 in / 647.7 mm, Truss Rod Type Dual Action, Neck Profile Modern C, Nut Material: Bone, Nut Type: Standard, Nut Width: 43 mm, Strings: D'Addario EXL110 (.010-.046), Boutique Mod: Quad Mod, Neck Pickup: Rockfield Tradition, Bridge Pickup: Rockfield® TexPlus Single-Coil (Alnico V), Hardware Finish: Gold, Tuning Keys: MK Die Cast, Bridge Type: T-Vintage Ashtray. 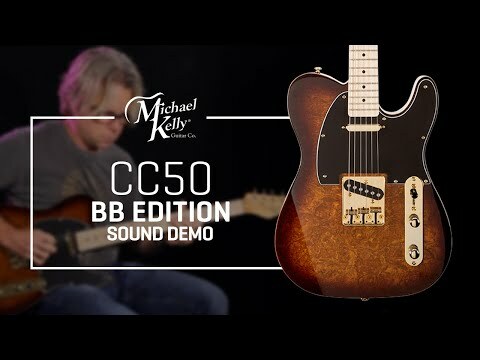 Do you own Michael Kelly CC50 Burl Burst Edition or have you had a chance to try it?